I start every day with at least 1, sometimes 2 cups (and on occasion 3 if Abe had a particularily rough night) of Gobena coffee. It is the best coffee that I have ever had, comes from Ethiopia and the 100% of the proceeds go back to make a difference there. Try it- you will love it! I can't believe that ONE YEAR ago today our precious boy was placed in our arms. It has been a year rich in so many ways, hard in many ways, but full of the Lord, His grace and tender mercy. We are sad today as the uncle did not appear in court. Courts are closed now. We will wait till Oct 5 and pray that will be the day. We are trusting in His sovereign grace and perfect timing. Our hearts are broken. I'm so thankful this morning as the Lord has so graciously extended an enormous amount of peace to me through His word. A sweet friend gave Moody and I an old devotional that she "happened" to find yesterday and thought it would be of encouragement to us right now as we wait upon the Lord to send us back to Ethiopia to get our son. I am reminded that His plan is always better than my own, His timing is always perfect, He is always working in our lives and His purposes are always served! The verse that has ministerd to me and taught me throughout the entire process is from Isaiah 55. He will bring our precious son home at His perfectly appointed time. I need to rest in that. Oh, the depths of the riches and wisdom and knowledge of God! How unsearchable are His judgements and how inscrutable His ways! For who has known the mind of the Lord, or who has been His counselor? Who has been given a gift to HIm that he might be repaid? For from Him and through Him and to Him are all things. To Him be the glory forever. Amen. It is my prayer that the uncle would return to the courts in Addis with a new ID, that we would be able to travel in September and bring our son home and that the Lord would be greatly glorified in the process. Still waiting. The uncle came to court, but unfortunately had an invalid id card. Please pray that he is able to get a valid card before Friday. The good news is that our case has been left open, and he just needs to take his new card to the courts. This mothers heart is sad as I long to go get my son, but will meditate on the above scripture and hope in Him. I do know that His timing is best. Waiting- a VERY common theme associated with international adoption. You wait at every step of the process........and here we are today, waiting for our new court date on Tuesday. We are believing in faith that we will pass, that we will be able to travel to bring our boy home at the end of September (yes, the 6 extra days for court will have us traveling 2 weeks later...boo). I was really disappointed on Wednesday and more emotional than I would have thought. It appears that this adoption has gone at warp speed ( 7 1/2 months from paperwork to travel if we pass on Tuesday) but the reality is, this adoption as taken almost 2 1/2 years to complete. From the very first moment that the Lord confirmed in our hearts the desire and call to adopt, it was ALWAYS for 2 children. We didn't know who they were, but there were always two. 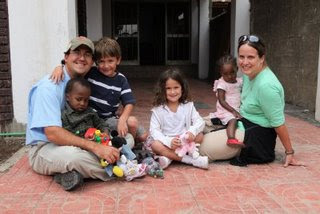 We began with one agency to adopt siblings 1-5 years old. We were told to expect a 1-6 month wait but most likely on the shorter end as we were open to older kids. 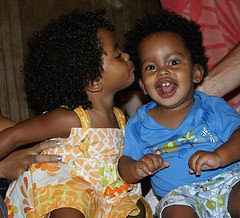 After 7 1/2 months and NO end in sight, I saw 2 beautiful children on another agencies waiting child list. We felt they were ours and began the process of redoing much of our paperwork to switch agencies. Once all of our paperwork was done and we were waiting for a court date, we got the devastating call that these two precious kiddos wouldn't be coming home. 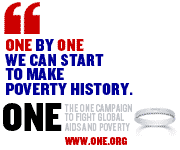 I remember feeling so very far from Ethiopia that day and questioning if we would ever get on African soil. The Lord graciously brought Abe to us several weeks later and it was clear why we switched agencies as they had our baby. The agency was going to issue us a second referral, but we knew the extra time to do so would cost us getting a court date for Abe before the rainy season. We proceeded with Abe and knew we would return as quickly as possible. I think we questioned returning after Abe's diagnosis for all of a second. The Lord knew all along about Abe and in His mercy, allowed us to have time alone with him to heal. We started the paperwork 6 months after returning home. We thought the process would take much longer this time as it just reminds me that we aren't in control. The Lord knew we needed to get going as our little guy had alreay been in care for too long. His timing is perfect. Prayerfully, we will pass court on Tuesday and bring him home just 2 days shy of him being there for a year, and our journey to bring 2 children home from Ethiopia will be complete. I'm thankful for the long road. I stand amazed at the rich relationships that have formed through the process. I'm so grateful for all it has taught me, though I really look forward to just being here as a family of 8! Please go say a big congratulations to the Morgan family and see their beautiful new daughter! She has been with our little man for almost 1 year- what a gift that they will always know each other. Not the news we had hoped to hear, but trusting in His unfailing love and perfect timing. New court date on Tuesday. They each got to hit the gavel. It was much more emotional than I expected. What a precious opportunity to once again promise to love this little blessing forever. Thank you Rainey for coming and taking the pics for us! We loved having you there. for dinner at Ethiopian restaurants in Dallas and the reality of it seemed so far away. Now look at all of the beautiful children the Lord has brought home!! The Funderburks are about to move to Ethiopia (I'm so jelaous) and will be with my little man until we pass court and can travel. I was blessed with the privilege of checking on all of the above kiddos as we traveled before they did. What a gift to tell them how very loved they already were and their parents were coming as fast as they could. The Lord has started bringing families into our path that have or are in the process of adopting from Arlington. What a gift to have a group of people right here in our community. 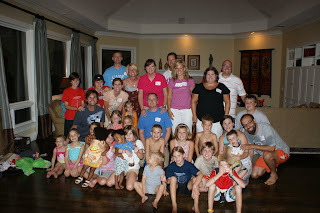 We had a gathering at our house last weekend and it was a blast. I have been waiting until I could officially post this and since she made it official on her blog- I guess I can too!! This is a family that we have enjoyed so much this past year. They do science and Spanish with us and have been constant encouragers in all things Abe. :) Oh, and they happen to be buying the lot next door and we will be neighbors. Isn't the Lord just amazing how He works?? 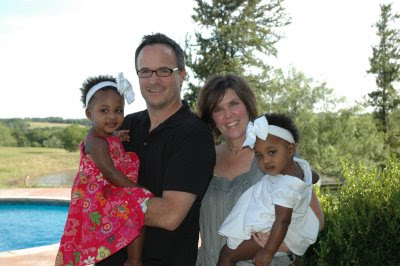 We couldn't be more thrilled that the Lord has called them to expand their family through adoption from Ethiopia!! Head on over and say welcome. Meet the Porters here. We are about a week away from court and keeping busy while we wait. Abe loves swimming with the big kids!! Abe and I were at Children's this morning for an EEG, hearing and vision tests. 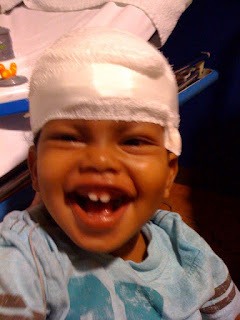 They had to place 30 electrodes on his head and lets just say, he didn't care for it too much. 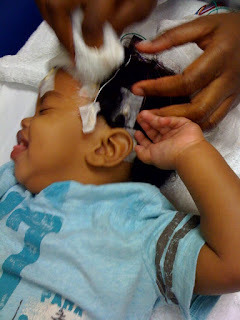 We have never been very concerned about his vision or hearing, but the EEG should give us some new information-- at least a good baseline for now. Don't you just love this kids joy for life? He is seriously the best teacher I have ever had. How should I take the sweet tech giving me a piece of paper with 2 websites that she was pretty sure would help me with Abe's hair?? :) I tried not to take it personally.